A daughter of top sire Uncle Mo, MOKAT is a graded stakes winner offered in foal to Medaglia d'Oro at the 2018 Keeneland November Sale. 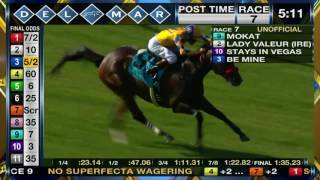 Winning the San Clemente H. (G2) at Del Mar at three, MOKAT won or placed in 5 graded stakes. She is a half-sister to Grade 2 winner Frolic's Dream.